"Lower Antelope Canyon - #5". This is another one of the beautiful images I created while visiting the amazing slot canyons in Page, Arizona. A slot canyon is a narrow canyon, formed by centuries of water rushing through sandstone and limestone rock. Slot canyons can measure less than 1 yard across at the top but drop to a depth of more than 100 feet at the canyon floor. The rock that makes up the walls of the canyon are draped in beautifully saturated colors ranging from the lightest yellows and oranges to the deepest of reds, magentas and blues. These canyons are a photographer’s dream. It’s really almost impossible to take a bad picture in the slot canyons. You are surrounded by unique rock formations which change in both color and shape as the sun moves by overhead lighting an ever-changing surreal environment. A short distance away from Lower Antelope Canyon, also in Page, AZ, is Upper Antelope Canyon. Slot canyons also exist in Bryce Canyon National Park and Zion National park in the state of Utah. The longest slot canyon in the world is Buckskin Gulch at Grand Staircase-Escalante National Monument in Utah. These incredible natural wonders are not native only to the United States. The Blue mountains in Australia, west of Sydney, also offers up some amazing slot canyons, but they are extremely difficult to access. 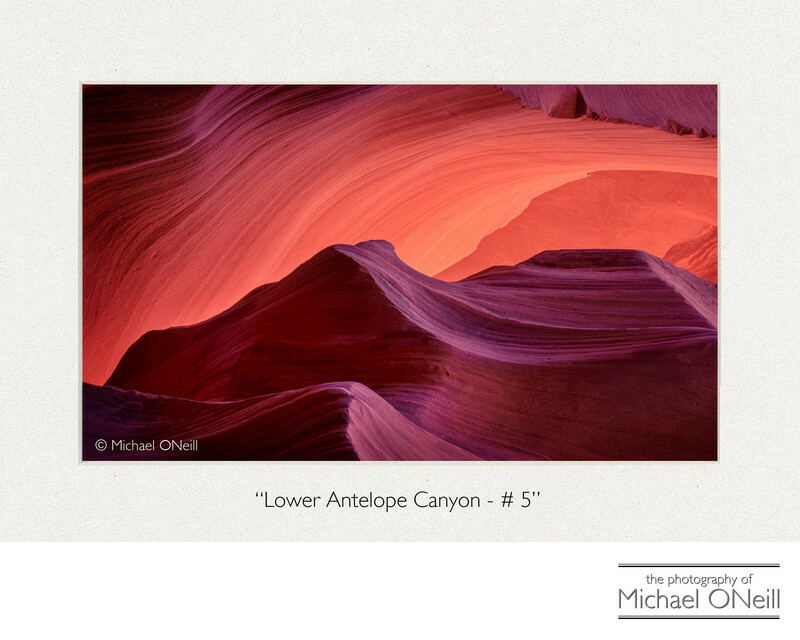 "Lower Antelope Canyon - #5", along with any of my limited edition fine art photographs can be acquired through the contact page of my web site or from any of the galleries that offer my works.